It is time to join the Yangtze River Festival! Sailing down the Yangtze from Chongqing to Yichang allows visitors to see the spectacular scenery of the Three Gorges along with its splendid cultural heritage and fabled local folklore. The cruise, which combines sightseeing with scientific, artistic and folklore exploration, is a national-caliber tourist program. The 193-km-long Three Gorges, consisting of the majestic Qutangxia, statuesque Wuxia and ferocious Xilingxia gorges, is one of and ferocious Xilongxia gorges, is one of the world's major canyons. Along the way there are such scenic attractions as the Fengdu Mountain. Baidi city, Shibao village, Zhang Fel's Temple, Qu Yuan's Temple, and the Three Gorges Dam. The three gorges of Qutang, Wuxia and Xiling form one of the world's largest canyons which spans west Hubei and east Chongqing for a 193-km stretch from Fengjie, Chongqing, to Yichang, Hubei. Here, theYangtze cuts a ferocious course through mountains whose dangerous images are disguised in graceful forms. A foggy, rainy weather combines with the heroic shape of the Qutang Gorge, the elegance of the Wuxia Gorghe, and the stupendous Xiling Gorge to form a dainty landscape, and endow the place with the best scenery anywhere in the world. Among the sites of historical interest on the Three Gorges are Sanyou Cave, Huangling Temple, Xiangxi River, Jiuyuan River, Qu Yuan's Temple, Shennong River, Lesser Three Gorges of Wushan Mountain, Ghost City at Fengdu, Shibao Village, and Baidi City of Fengjie. Visitors also have the opportunity to see the well-known Gezhouba Water Conservancy Project and the ongoing construction of the Three Gorges Water Conservancy Project. About 40 luxury cruises are shutting on the Yangtze River; 20 of them wear star-rating insignias based on the equipped facilities and quality services offered. The Changjiang Tourist Boat Company is based on Wuhan and Yichang, and that is why Hubei is the best place for a cruise on the Yangtze River. Situated at the breakpoint of upper and middle reaches of the Yangtze in west Hubei, Yichang is a major tourist city with the splendid Three Gorges up the river. The land of Yichang itself is studded with tourist attractions, including Gezhouba Water Conservancy Project in northwest Yichang, Sanyou Cave, and the battlefield of Yiling during the Three Kingdoms Period. The famous Gezhouba Water Conservancy Project is on the trunk section of the Yangtze in northwest Yichang. Visitors also have the chance to see Chinese sturgeons, an endangered species contemporised with dinosaurs. A grownup sturgeon can grow to 4 metres in length and 500 kg in weight. Sailing upstream the river, one arrives in Zigui county for a visit to the tomb of the great poet Qu Yuan and the temple dedicated to him. The birthplace of Wang Zhaojun, a Western Han beauty, lies by the picturesque Xiangxi River, where dragon-boat cruises are available. 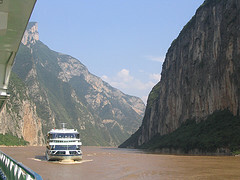 We also assist you to purchase Yangtze River ferry tickets and cruise tickets.